Royal wedding 2018: What titles might Harry and Meghan get? 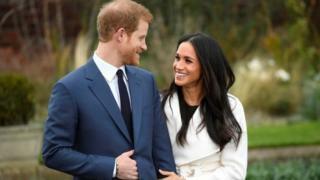 Saturday marks a new chapter in the lives of Prince Harry and Meghan Markle - and the couple are expected to receive new titles ahead of their wedding. Along with the Duke and Duchess of Cambridge, William and Kate were given the Scottish titles Earl and Countess of Strathearn - seen as a nod to their time at the University of St Andrews - and the Northern Irish titles of Baron and Baroness of Carrickfergus. So, what are Harry and Meghan likely to receive? "Prince William was given English, Scottish and Irish titles but it is more likely Prince Harry will only get English and Scottish titles," says Lucy Hume, associate editor of Debrett's Peerage and Baronetage. "He is the younger son and not directly in line to the throne. "There are a limited number of dormant or extinct peerages or titles available and it is most likely Prince Harry will be given the title of 'duke' in England - and it may be as well that he receives a title in Scotland such as 'earl'." Who else could walk Meghan down the aisle? For Harry and Meghan's main title, the Queen is expected to choose from one of the vacant dukedoms. Vacancies include the dukedoms of Clarence, Connaught, Kendal, Ross, Sussex and Windsor. There are also a number of unoccupied, dormant dukedoms including Cumberland and Albany. Ms Hume continues: "Factors that might be taken into account include who held the title previously and whether there are any negative connotations, but ultimately it is the Queen's decision based on advice from her staff." The dukedom of Windsor is one that could be seen to have "negative connotations" as it was the title given to Edward VIII after his abdication in 1936. Both bookmakers and royal experts feel the dukedom of Sussex is the most likely option. The dukedom of Clarence is the bookmakers' second favourite. "The Duke of Sussex was a title that became extinct around 200 years ago," says Ms Hume. "The previous holder of the title didn't have any legitimate heirs and there is no terrible or controversial history associated with the title." Who was the previous Duke of Sussex? Like Harry and Meghan, the duke lived in Kensington Palace. He died in 1843, aged 70. Augustus twice married for love but his father did not approve of either match and so did not give his consent to either marriage. As a result, neither of the duke's children were considered legitimate heirs to his title. Any titles given to Harry and Meghan are likely to be little more than that. William and Kate were each given three titles but none of them came with land or powers. Though there are currently six royal dukes in the UK, there are only two royal duchies, or territories associated with a dukedom. Ms Hume says: "There is the Duchy of Cornwall, which belongs to the Prince of Wales, and the Duchy of Lancaster, which belongs to the Queen. "Those do have private estates attached to them and the Queen and Prince of Wales derive an income from them but those are the only ones."